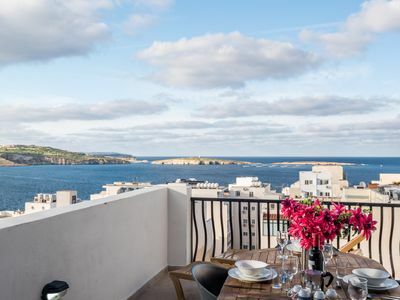 This Sea-view studio penthouse is on the 7th floor and has a lovely terrace with commanding views of most of St Paul’s Bay including St Paul’s Islands. The terrace is equipped with a gas Bbq and garden furniture (sunbeds, chairs, and table). This studio penthouse has a double bed and a single sofa bed. 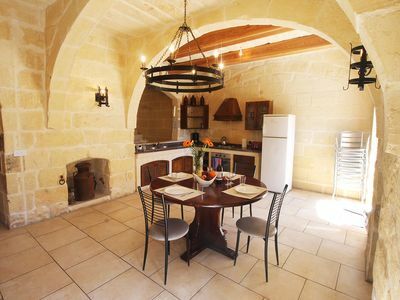 The kitchen dining living part has a small terrace with washing machine and clothes drying facilities. 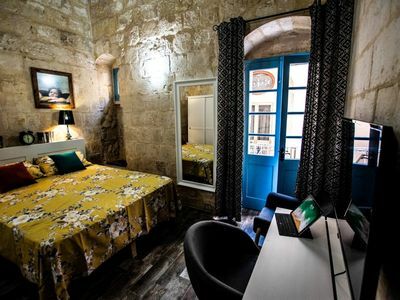 This studio penthouse is ideal for couples or small groups up to 3 persons. Fully Air-conditioned and Fans are also provided. Bugibba is one of the most beautiful villages in Malta. The flat is located in a quiet area, just 150 mt from the promenade, where a nice rocky beach is ideal for jumping into the sea. Bugibba has a busy town centre full of shops, banks, pharmacies etc. There one might find more bars, restaurants (also Mc Donalds and Pizza hut) and diving and water sport centres. Ferries to remote beaches and islands like Comino and Gozo leaves from the Bugibba Jetty (just 300 meters away from the flat). The flat is also close to the best sandy beaches like Mellieha Bay, Paradise Bay, Golden Sands, Gnejna Bay (15 minutes by bus). In winter long walks and picnics in the countryside and along the sea are a must. In summer one can enjoy the sun at the beach in many ways from the most relaxing to the most adventurous ways. In the evening a walk on the promenade or a local village feast is a must. The bus stop is located on the promenade down the road. These consumption for water and electricity should be more than sufficient for normal use for a week. 0. 42c per kWh for electricity and 8.60 € per cubic meter for water. Regarding the monthly rate, please note that the price does Never include bills of gas, water and electricity. The guest will just pay what they consume. Usual estimation is euro 60/80 per month.